Oh my, I can’t believe it’s been so long since I last posted here. So sorry to have abandoned you so just wanted to let you all know that I’m still here! 🙂 I’ve just been so overwhelmed with work, home repairs, travel and wait for it……redesigning this blog!! Woo Hoo! Within a few weeks I’ll be able to share with you a brand spanking new Hot Lollies blog that’s bright and lively with great new spicy content to go along with it. I’ll still keep posting here until I make the switch over to the new design so please don’t go anywhere! You see, I even made a roasted chiles and vegetable frittata for you! How can you resist a spicy, hearty frittata? I saw this episode of Ina Garten’s Barefoot Contessa a while ago and immediately went online to bookmark this frittata recipe. I love Ina’s recipes. She makes the most luscious comfort foods look so easy to make. I don’t always get a chance to watch her show but this episode featured all the things to make with cheese so clearly I had to drop everything! Ina made a bacon and Gruyere grilled cheese, a rib-eye steak with Stilton cheese sauce, a coconut cupcake with cream cheese frosting but what really hooked me was a roasted vegetable frittata. Tender pieces of lightly season roasted vegetables tossed with an egg and cheese mixture and baked to perfection! It’s a great way to start your Sunday morning with a bright and peppery egg dish. The chile peppers add nice heat that isn’t overwhelming and really lets the vegetable and cheese flavors come through. 1. Preheat oven to 425 degrees, spread zucchini, peppers (except habanero) and onion on baking sheet, drizzle with olive oil, sprinkle with salt & pepper and toss around until nicely coated. Heat for 10 minutes then add the garlic and toss again. Heat for another 10-15 minutes. Remove from oven. 2. Turn down oven temperature to 350 degrees. In a bowl, beat the eggs, add the milk and beat again. Stir in the Parmesean cheese, season with salt and pepper and mix well. 3. Melt butter in a saute pan, add the scallions, habanero pepper and cook until soft. Add the roasted vegetables and mix well. 4. Spoon the roasted vegetables into two ramekins until each is 3/4 full and top off with the egg mixture. Bake in the oven for 20 minutes then top each with the Gruyere cheese and baked for a couple of minutes until cheese is melted. Weekend Brunch: Huevos Rancheros and Michelada, Que Bueno! This here is one of those dishes that’s perfect after a night of partying…just in case there’s any imbibing planned for this weekend! Huevos rancheros with a ice cold Michelada! 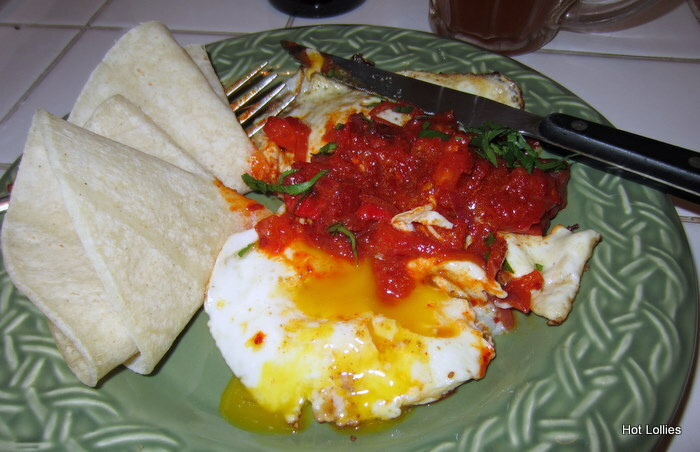 Huevos rancheros are just fried eggs with a spicy tomato based sauce. I’m sure there are a hundred varieties out there but here’s my version, a nice fried egg over-medium and a sauce made with jalapenos and fresh, vine-ripe tomatoes. Pair the huevos rancheros with a Michelada for a great brunch. A Michelada is a spicy beer frequently made in Mexico and some Latin American countries. Everyone makes it slightly different depending on the city or region of country. I’ve seen it made with tomato juice but prefer it without but most importantly, it has to have chiles or a great hot sauce! 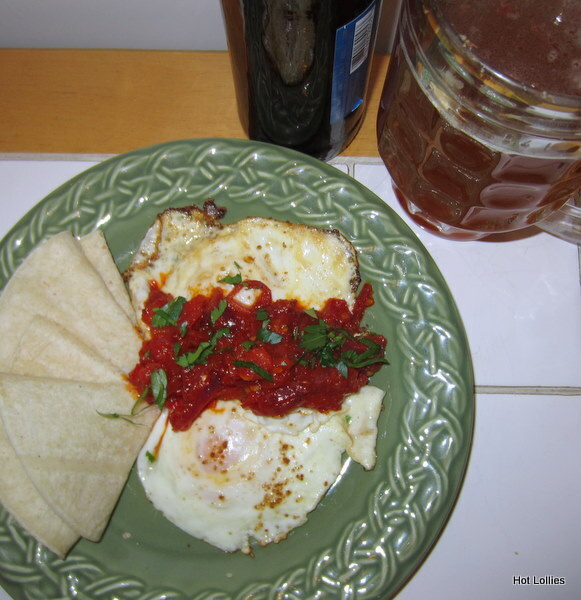 The guajillo red salsa brightens up the eggs in this dish and gives it a light smoky flavor. The fresh tomatoes make a huge difference and definitely better than using a canned sauce. You can also add chorizo sausage to make this a heartier dish. 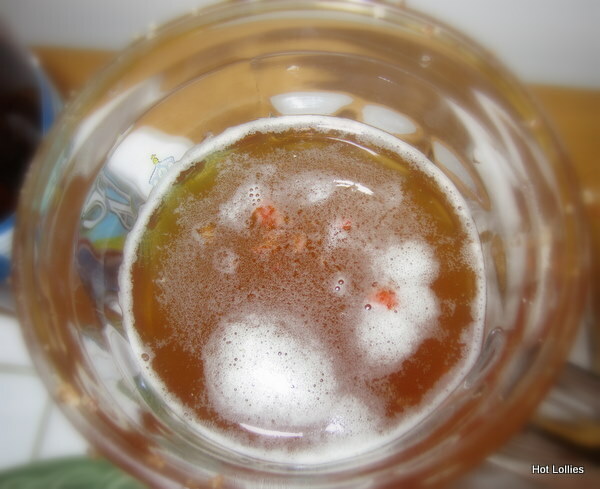 Rim a tall glass or beer mug with habanero salt, add agave syrup, worcestershire sauce, hot sauce and swirl around. Slowly add an ice cold beer and stir (not too much), add squeeze of lime wedge and pinch of salt! Ever have those days when nothing seems good enough for dinner except a good breakfast? I have those often. Either I’m too tired to make something after a long busy day or I’m just feeling a bit lazy. Sometimes a bowl of cereal will do and other days a spicy egg and cheese sandwich is in order…but not just any egg and cheese sandwich, one made with fried, salty Dominican white cheese. I’m sure you’re wondering “what is that”? Dominican Republic is mostly known for it’s white sand beaches, fantastic golf courses, great cigars and fabulous vacation getaways but cheese? Definitely not the first thing you think about but to a native, whether near or far, it reminds us of childhood, of home and Mom. As a child, breakfast consisted of eggs, fried cheese, sausages (salchichon) and plantains a dozen ways. Mom would make this almost daily for my Dad but as the years passed my siblings and me became more accustomed to American culture. Our traditional breakfasts were reserved only for weekends and for me, eventually replaced with a lighter fare. However, every once in a while I crave fried cheese and it always takes me back to those good old days. You can find this white cheese in your local supermarket or Latin bodega. Dominican white cheese is firm, salty and great for frying because its high in salt and made with acid which doesn’t allow it to easily melt like other cheeses. It’s similar in texture to feta but not as salty or crumbly. When it’s pan fried in a bit of oil a nice crust forms and the inside stays soft and gooey, perfect for sandwiches since it won’t fall apart or slide out. 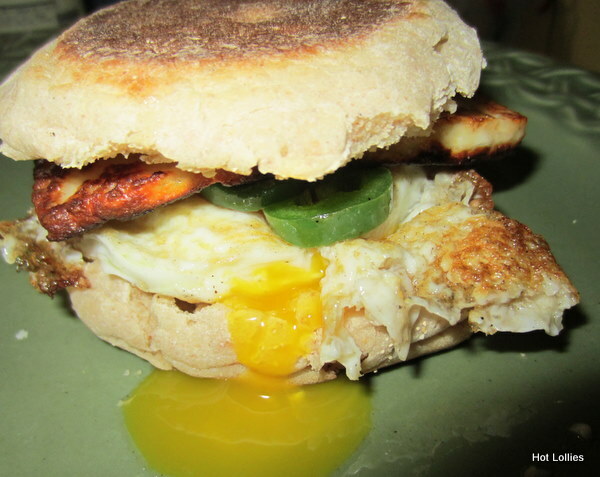 I didn’t have any plantains (blasphemous for Dominicans) and really didn’t want to make an elaborate meal so I made the perfect spicy breakfast sandwich for dinner and it was so delicious! This is a great vegetarian (Lacto-Ovo Vegetarians) option but if you want meat just add salchichon or bacon for a more filling meal. Saute a few jalapeno slices in a bit of butter on medium heat for about 1-2 minutes and remove from pan. Fry the egg in same pan with a bit of oil (2 tbsp) and add a pinch of Adobo. You can skip the Abodo if you’re watching your salt intake, since the cheese may be salty enough. 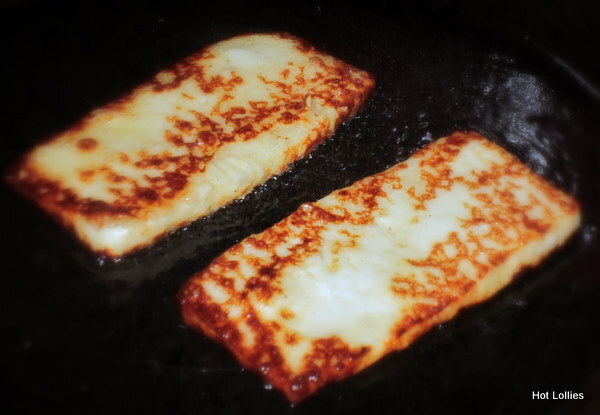 You will want to fry the cheese last so it can be soft and hot when you eat it. Fry the cheese on one side for about a minute and flip over and fry the other side until a nice crust forms. Assemble all on a toasted whole wheat English muffin and dinner is served! Add as much jalapeno as you like to adjust the spiciness.